If closed-door talks at Balaji Motion Pictures are an indication, then Shahid Kapoor won't feature in the sequel of Once Upon A Time In Mumbaai, the film based on the underworld. It is learnt that Kareena Kapoor is rooting for Imran Khan, her co-star in Short Term Shaadi, to play the character inspired by Chhota Rajan. Interestingly, Kareena herself isn't being paired with Imran in the Milan Luthria directed movie, as she has already confirmed to pair with Akshay Kumar, who plays the role of a don, inspired by Dawood Ibrahim. According to an insider associated with the film, "Kareena feels that Imran would bring novelty to the character inspired by Rajan. More so because he has played strong romantic roles in most of his films." 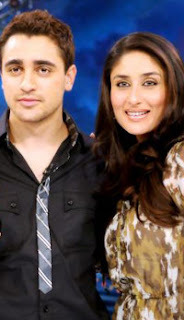 Besides that, an insider told us that working in the project, Short Term Shaadi, Kareena is enthused about how well she gets along with the co-actor. "That's also one reason why she's so strongly recommending Imran's for this movie, " said our source. Now, the actor will have take a call when the producers approach him. However, our source maintained that producer Ekta Kapoor is also backing Kareena's suggestion to director Milan Luthria. "But it's still some time before they connect with Imran, as currently Milan is focused on finishing the last schedule for The Dirty Picture, for Ekta's company. In another week or two, talks should be initiated, " said our source. When contacted, Tanuj Garg, CEO Balaji Motion Pictures said, "It's still too early to talk about the parallel male lead. When things are finalised, we'll make a formal announcement."